The rigid, high-grade aluminium track section and maintenance-free, wheeled roller hooks are just an introduction to the many features of the YewdaleMovatrack 100 curtain divider track system, which is in use in many hospitals globally. Designed to give years of trouble-free service, this curtain divider track system uses die-cast aluminium wall shoes for a secure locating where tracks meet the wall, and suspension hangers for a rigid connection to the ceiling, unless directly ceiling fixed. Supplied with a curtain removal point as standard. Strength and simplicity make the YewdaleMovatrack® 100 track system the first choice for a full number of divider / screen applications. The maintenance-free, premium quality track system has an attractive, all-enclosed, flat top aluminium profile requires no additional expensive inserts, offering you more for less. A reliable partner for the long-term duration, it is able to span 3.0 metres between hangers, keeping both sight lines clear and installation costs down. In a similar fashion, curtain removal points are provided as standard on every track for added convenience when replacing curtains. The self-lubricating roller runner hooks are quickly loaded into the track through this point of access, making the process a pleasurable experience. 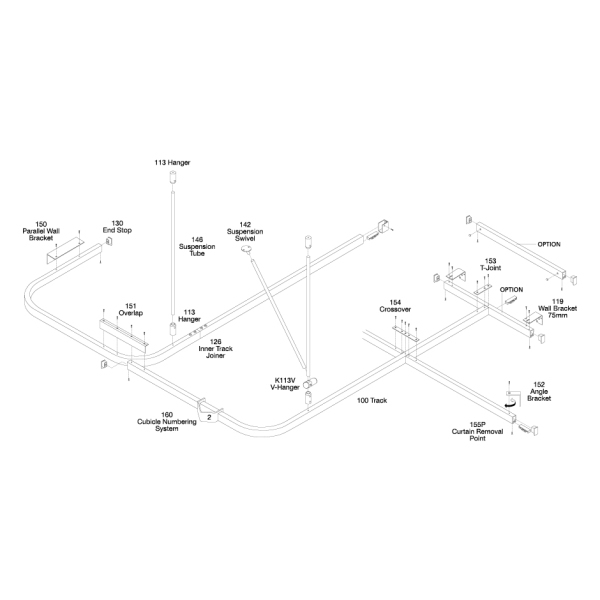 Complies fully with the requirements of HTM66. Silver anodised track; Any RAL colour available to order; Biosafe® antibacterial treatment option available within white powder-coated finish only; Cubicle numbering system; Track mounted uplighters; Stainless steel roller hooks or rings. 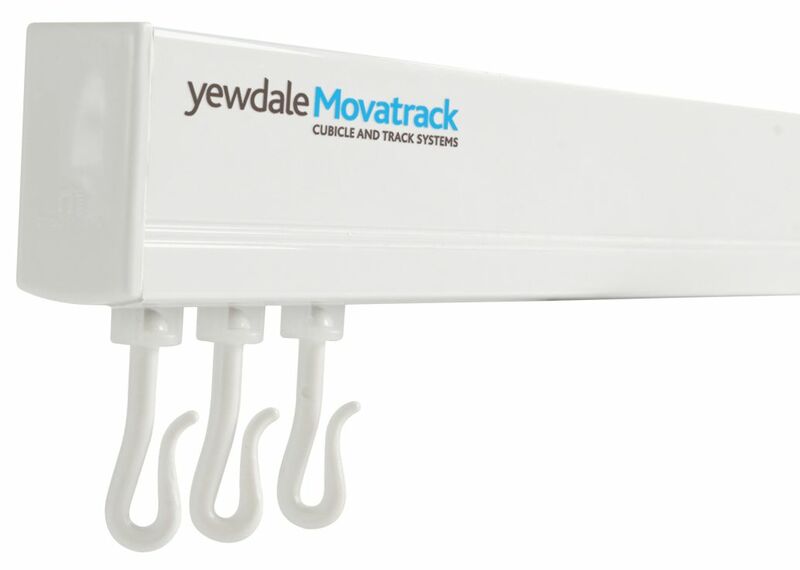 The YewdaleMovatrack® 100 curtain divider track system as manufactured by Yewdale, +44 (0)1268 570900. Track manufactured from premium quality aluminium with silver anodised / white powder-coated finish, able to span 3.0 metres without support. Double hangers to ensure full functionality of system. Complete with roller runner hooks at 10 per metre, curtain removal points per section and, overlaps as necessary, spaced in accordance with manufacturers recommendations. Flame retardant curtains from the YewdaleHarrier® range. 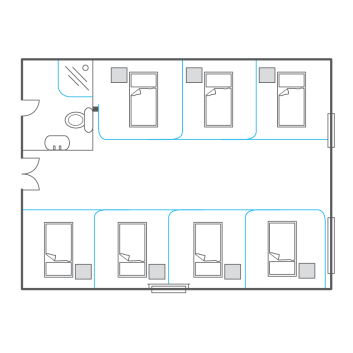 Layout as shown on accompanying drawings. Fitting to be carried out by trained and accredited personnel. Sizes shown in millimetres unless otherwise specified. *Parallel wall fixing brackets require closer spacing. Is this track suitable for Easy Fit curtains please? Our Movatrack 100 curtain tracks comes with a curtain remover point as standard for easy fitting of curtains. Should you need any further information please don't hesitate to contact us.